Hi foks. Today we are chatting with Michelle Beber. 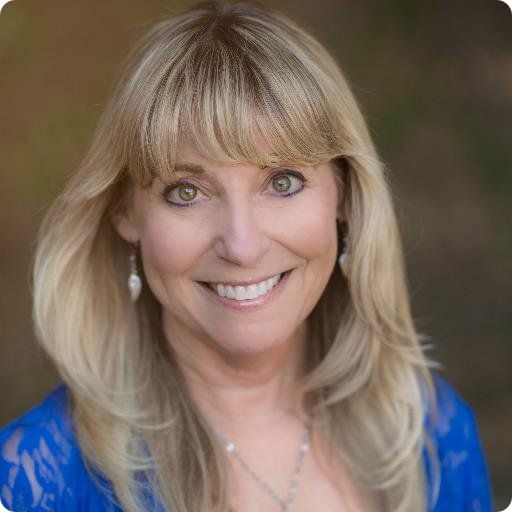 Michelle is certified Angel Intuitive, Spiritual Teacher and Archangel Life Coach. Her life changed when she attended a spiritual retreat in 2008. There, she learned about repetitive number sequences known as “angel numbers.” Having always been fascinated by things “beyond this world,” she started researching everything she could about “angel numbers,” which, of course, led her to discoveries about angels themselves. I’m not your traditional children’s picture book author. I’m an “angel intuitive” which means I’m able to “connect” with the angelic realm. Some of the beautiful messages I’ve received from the angels have turned into manuscripts for children’s books. I’m also what’s known as a “lightworker” who’s working with Archangel Michael to bring God’s healing love and light to the world, especially to children. That’s a tough one because I hate to get out of bed. Ha, ha! I guess the fact that I know I have tons of things to do and very little time to do them. If we could bring the person back from the dead, it would be “Dr. Seuss.” He was a genius, and I’d love to have the opportunity to get inside his head. If you’re talking about someone who’s still alive, I’d like to meet with Louise Hay, the founder of Hay House Publishing, to ask her about her early days as a fledgling author. The idea for Angels, Angels, Everywhere came to me in the last place I thought anything creative would ever happen … while I was sitting in my car! Ha, ha! I was stuck in horrible traffic on my way to work one morning when these beautiful words came into my head: “Angels, angels, everywhere … some are here, and some are there … all they want to do is share … share their love with you.” As my car inched along, more words started to come to me quickly, all in rhythm and rhyme. Luckily, I keep a notepad in the car, so I wrote everything down as I heard it. These words became the text for the book. 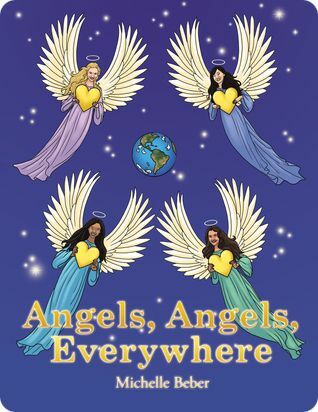 I was also given a vision of four female angels of different races flying around the Earth. That vision became my cover. Believe it or not, most of my ideas have come to me when I’ve been sitting in my car in traffic. It’s a great way to pass the time on my long commute to and from work, and I guess the angels feel that I’m a captive audience. If words come to me, I write them down on a scratch pad and type them later. The other place that seems to invite inspiration is when I sit outside with nature surrounding me. It’s me, my dog, and a pen and paper. I remember loving to write as a child and writing poetry when I was a teen, but the realization that I seriously wanted to publish a book was when I finished my first children’s picture book manuscript in 2010. I’ve written many other manuscripts since then, but when the angels gave me the beautiful words and visions for Angels, Angels, Everywhere, I just knew it was the one that was supposed to be my debut book. Since my book is interactive, I would have to say that the reader is the main character. The reader is going to learn how to deal with emotions like fear, anger, sadness, and loneliness by asking the angels for help. Also, the reader is going to learn that angels share in their joy when they are proud, happy, and having fun. Finally, the reader is going to learn that he or she is unconditionally loved at all times. I recently released the promotional video for my book on YouTube, I’m continuing to write my blog, and I’m having a great time on this fantastic book tour throughout the summer. Isn’t communicating with the angels enough? Ha, ha! What free time? Ha, ha! Most of my free time is spent working on marketing and promotion, but I do take time to read and post inspirational and motivational messages on social media. I used to think it was a complete waste of time, but now I love it! I’ve met many wonderful, like-minded people on the internet and have learned more about metaphysics. My website is www.michellebeber.com, and my blog is www.heartofalightworker.com. I have social media accounts on Twitter, Instagram, Facebook, Goodreads and Pinterest. There are links to all my accounts on my website. Don’t forget to ask the angels for help! 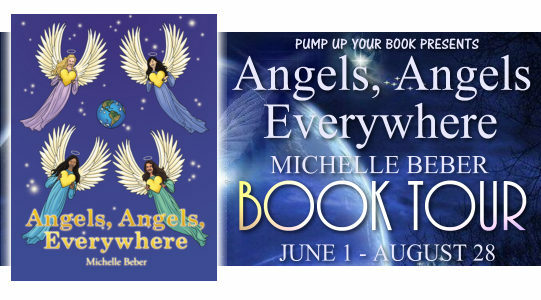 Posted on June 16, 2015, in Guest Authors and tagged @bebermichelle, Angel Intuitive, angel numbers, Angel Oracle Card Reader, Angels Angels Everywhere, Michelle Beber, Pump Up Your Book, PUYB, Spiritual Teacher and Archangel Life Coach. Bookmark the permalink. Leave a comment.